The 40-count Brooklyn Bean sampler pack includes four samples of light, medium, and dark-roast blends: Breakfast Blend, Boardwalk Blend, Brooklyn Bridge, Colombian, Cyclone, Donut Shop, Fugheddaboutit and French Roast. This is exciting to me because I like to try different flavors of coffees, but don't like buying it in bulk in fear I may not like it. This way I am able to try it and see what I think before I buy it in a larger quantity. 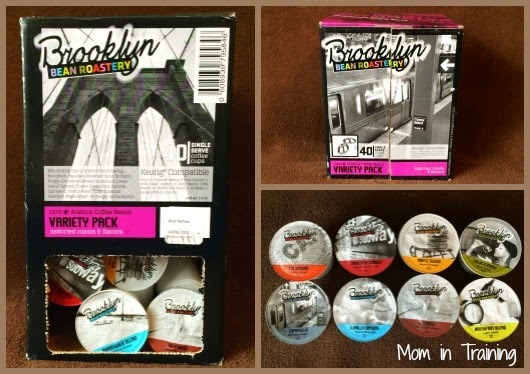 I've actually been quite enjoying the Brooklyn Bean varieties and love the box that they came in because I was able to open the front bottom and use the cups right from the box. It's so much easier to use the box to store them in then try to stack them beside my coffee machine.